For entrance door: 1-3/8" - 1-3/4". For door: 1-1/8" - 1-1/2". Backset: 2-3/8". Latch: 7/8" Drive in. Interior door nickel. 2-3/8" backset. For door: 1-3/8" - 1-3/4". 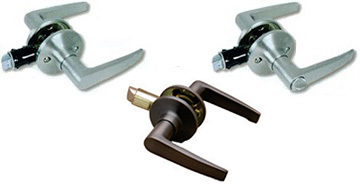 For Outswinging Storm Doors 1" To 1-1/4" Thick. Interior Locking Mechanism. Complete with Strike and Installation Screws. 1-3/4" Hole Centers. Black. 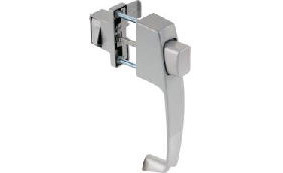 For Outswinging Storm Doors 1" To 1-1/4" Thick. Interior Locking Mechanism. Complete with Strike and Installation Screws. Aluminum. Centers: 1-3/4". Ideal For Covering Exposed Holes In Doors. Covers Up To 2-5/8" Hole, Self-Centering Disc Prevents Plate Movement. For Wood Or Metal Doors. 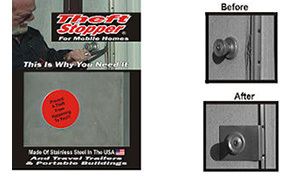 Allows you to easily repair damage from break-ins without replacing entire door, and protects against a reoccurrence. 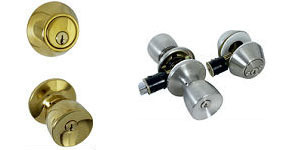 Just three easy steps: remove screws from doorknob, place Theft Stopper on outside of door, then replace the knob. Fits most outswing/back doors.